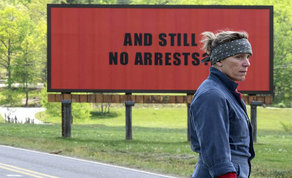 Martin McDonagh’s ‘Three Billboards Outside Ebbing, Missouri’ continues its impressive awards seasons run emerging as the big winner once again at the 2018 London Film Critics’ Circle Awards. The Blueprint Pictures production received the award for ‘Film of the Year’, while Frances McDormand who plays the movies’ protagonist picked up another award for her portrail of ‘Mildred’. McDonagh himself also picked up the award for Best screenplay at the London ceremony, which further supports the movies bid to capitalise on the seven Oscar nominations received last week. Irish actress & ‘Lady Bird’ star Saoirse Ronan missed out to Sally Hawkins who picked up the ‘Best British/Irish Actress’ award for her roles in ‘The Shape of Water’, ‘Maudie’, and ‘Paddington 2’. ‘The Killing of a Sacred Deer’ star Colin Farrell also lost out to Daniel Kaluuya who won the ‘Best British/Irish Actor’ for his performance in Oscar nominated ‘Get Out’.